Last month the kids and I wrapped up a group reading of the book, The Secret Garden. When the garden in our story began to bloom, I really wanted them to have a feel for what it must have been like for the main character, Mary. We set out in search of a place called, Gatiss Gardens, but must have over-shot it because I never found it! We ended up going to a park in the main town north of where we live instead. We were able to spot climbing roses.... and a lot of roses in general... along with trellises and other lovely flowers everywhere. I had them bring their backpacks and sketch books. 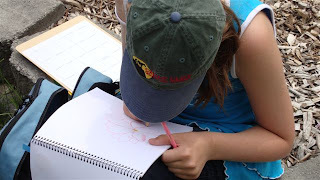 I wanted the children to articulate detail in a flower of their choice and try to draw it. I will be honest and say I didn't really expect them to spend much time at this task. But I was amazed at the intensity of their focus and the time they took and detials they sketched. I found myself waiting on them for a change! Bk found some rose petals on the ground and laid them on her sketch pad so she could trace them and color to match them! We did end up taking these little finds and putting them in the flower press at home. There are two large gardens at the park we went to. 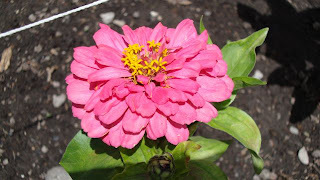 We started first in the rose garden and ended in the annuals garden. With all the extra time to just relax, I wasn't quite sure what to do with myself! So I sketched too and decided to get creative with my camera ;-) Here you can see me and Bk's feet... she was hunting for daisies, her favorite! Yes, I am wearing my favorite floppy hat. Bk and I are comparing our renderings of the pink flower you see top left. (My husband hijacked the close-up!) I am bad at names, whether it is people or flowers, but these had petals shaped like little hearts! Bk and I both wanted to sketch their delicate beauty. It was simply lovely sitting next to my youngest and sharing this experience! We both sketched the one on the left as well, the stamen are shaped like stars! Our field trip was amazing. I was actually glad we had not found Gatiss Gardens since I don't think we could have sprawled out quite like we did at Wo odland! 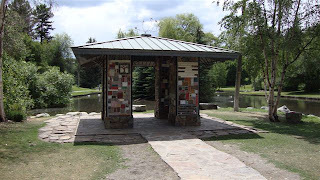 I already have our return trip planned; The gazebo here is covered with tiles textured with sayings and pictures (such as the one at the beginning of this blog). 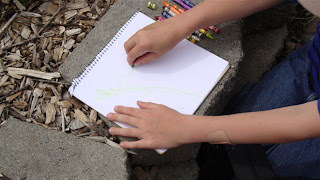 I want to bring some good rubbing paper and charcoal and crayons... won't that be another great tactile trip? !